Firstly ask yourself, ‘was my dog stolen or is he just lost?’ If you are of the opinion he was stolen, notify the police immediately. Supply them with details of any chip or tattoo registrations and hand over a clear photograph. Write down any information as to where he was last seen, if there were suspect people in the vicinity and the value of the dog – you may have just bought him for £1,000 pounds, for example. If you have information where the dog is being held, inform the police. If they do not act DO NOT go in to retrieve your dog yourself – it could be dangerous! Telephone your local paper and tell them. There are instances where the police have been forced to act as the newspaper is going to publish the story – force their hand! There is a campaign to get the police to help more with the amount of stolen dogs in the UK, which is gaining interest from dog owners and public alike. There are some very helpful volunteers in the community that are ready to help in your time of distress. Doglost is a national network of volunteers who are notified as soon as a dog is lost or stolen in their area. A poster is produced with information from the owner and emailed to every registered helper in the area. These helpers may just be able to put up a few posters; others can walk the area helping with the search. With the amount of dogs being stolen increasing every day some helpers even have information on thieves working their area. Many arrests have been made this way. Doglost exists on donations and the organisers are also volunteers. Above all the Doglost site can give emotional support and guidance through its online forum where a page is devoted to every dog that has gone missing. Why not sign up as a volunteer? Members will also supply vital information in who to contact and what to do in tracking down your dog. You most vital tool whether the dog is lost or stolen is ‘poster power’. 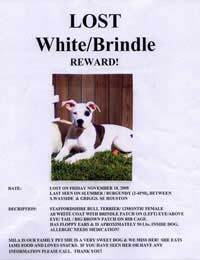 Employ friends and family to cover the area with posters showing a photograph and details of where your dog was lost. Be prepared for hoax calls – it may be worth using a mobile telephone number in the advert as this can be changed at a later date. Keep replacing the posters – quite often council workers take them down. Leave them in veterinary surgeries, pet shops and supermarkets. Ask tradesmen to stick them on their vehicles. Tell you postman and your milkman. Update the dog warden and police. Leaflet all houses and pubs in the area the dog was last seen. Sadly a lot of animals stray onto railway lines and motorways and the worst scenario has to be faced. Keep in touch with the highway agency and rail network (your local station manager will give you a contact number) you may be able to recover your dog's body but at the least you will have closure. If the area your dog went missing is covered by CCTV cameras then ask the owners to check their tapes. Your local council office will know who owns them. Contact all rescue agencies and boarding kennels in your area, even those further afield. These people will have scanned any strays that are delivered to them and could greatly assist your search. Contact local newspapers and radio stations. Try to think of a different angle that will make your loss stand out from others. He may belong to a sick child, perhaps the police won’t help you, your dog may be a winner at Crufts. Think of a newsworthy story – be your own press officer! If you have a good story or perhaps you have a novel way of advertising your loss then get onto the national press and local television stations immediately, they are always interested in a newsworthy story. Check your pet insurance policy as you may be able to claim a reward fee and (god forbid) a replacement value if the dog dies. It can be a good thing to offer an award, there again these days dogs are often stolen for the reward money. Perhaps advertise that there will be an award made to charity in the name of the finder – this will stop the gold diggers. At last! Your dog had been sighted but may be too afraid to make an appearance, its amazing how quickly they can become feral. Don’t go charging in expecting a grand reunion, it will frighten off the dog. Instead leave a trail of food in set areas so that he comes back to the spot. Also, leave scented rags that he will associate with you and other members of the family. Do this in a triangle area around where he was last spotted. Above all be patient. Hopefully you will never have to go through the traumatic experience of looking for a lost dog, but it does help to be prepared. By keeping some vital information at hand you will not lose valuable search time if the worst does happen. Along with registration documents and veterinary information, keep a record of microchip, tattoo and other safety schemes that you belong to. Your Kennel club registration will also have useful information on it. It is worth keeping a ‘canine information’ folder on each of your dogs. Make sure you always a have some clear photographs of your dog. A full body shot from both left and right sides. A face shot showing any eye colour and scars. Even a shot of the rear of your dog as sometimes the tail is distinctive. If your dog has his coat clipped update the photographs, as he ages update them as well. This is not only an ideal search aid but can help with proof of your ownership as sometimes found dogs are sold on by rescue agencies without checking to see if he has been lost. Hopefully your dog will be home very soon, many of them are. However, if you are one of the many owners that have a long search ahead of them, never give up. There are many examples of dogs turning up months – even years after they have gone missing.